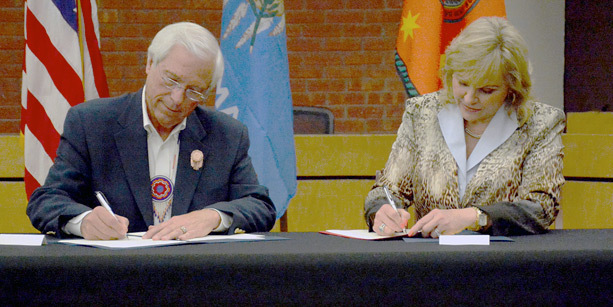 Cherokee Nation Principal Chief Bill John Baker and Oklahoma Gov. Mary Fallin sign a hunting and fishing compact expanding the hunting and fishing rights of all Cherokees living in the state of Oklahoma. Effective January 1, 2016 and thanks to a historic agreement between the Cherokee Nation and the State of Oklahoma, all Cherokee Nation Citizens residing in Oklahoma are eligible for a free Cherokee Nation Hunting & Fishing License. The Compact is an agreement between the Cherokee Nation and the State of Oklahoma, as sovereign governments, to promote the proper management and conservation of a shared wildlife resource. The new compact creates a joint system that allows Cherokees to hunt and fish in all 77 counties of the state with just one license. The Cherokee Nation began mailing the licenses in December. VERIFY MAILING ADDRESS IS CORRECT ON CHEROKEE CITIZENSHIP CARD. CONFIRM SOCIAL SECURITY NUMBER IS CORRECT ON CHEROKEE CITIZENSHIP RECORD. Our Frequently Asked Questions guide is available here. For additional information, contact the Cherokee Nation Tax Commission at 918-453-5100.